Back by popular demand, Live Nation’s Third Annual Summer Kickoff Celebration is geared up to be an incredible day of live music, food, games, and family fun! 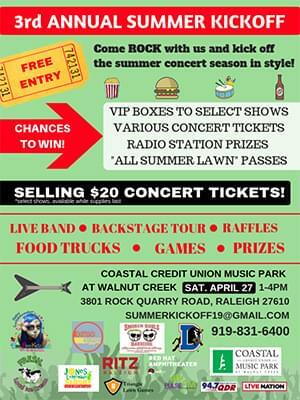 Come out to the Coastal Credit Union Music Park on Saturday, April 27th from 1pm – 4pm and experience all the fun! 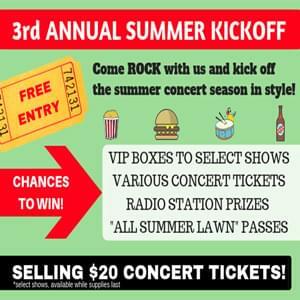 Kick off the summer concert season with chances to win big time prizes such as season-long grass passes, VIP Club Boxes to select upcoming shows, various concert tickets to multiple Raleigh area venues, and much more. Enjoy live music by Retro Candy or stop by the radio hangouts to meet your favorite DJs from Pulse FM and QDR. Be sure to take a backstage tour of the Coastal Credit Union Music Park too! Stop by and enjoy lunch at the delicious food trucks including: Smoken Souls Barbecue, Jones Lemonade Slushy’s, FRESH. Local Ice Cream and more! Kids will love the face painting and balloon animals from BeeBee Kidz Face Painting + Balloon Animals and games from Triangle Lawn Games.